5KPlayer download for Windows and Mac. 5KPlayer is a free and safe media player, online video downloader, iPhone iPad screen recorder and airplay streamer. It is totally free and safe, no adware, no spyware and no plugins. It deals videos in almost any format and forms even 4K Ultra HD. No lag, no stumble issue. Also, it is able to play music, DVD, online radio, etc. Videos from YouTube, Facebook, Vevo, DailyMotion, Niconico and many others sites can be downloaded with 5KPlayer. It is possible to customize video resolution and format before download. 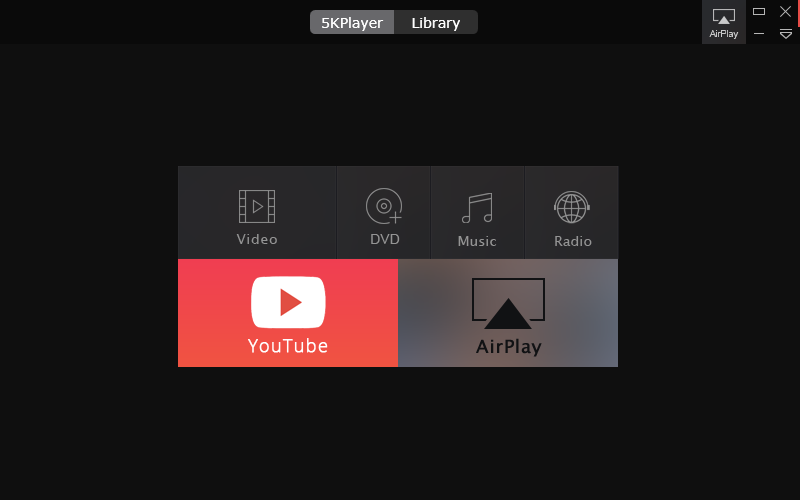 By click the icon of AirPlay, 5KPlayer allows you to connect iPhone/iPad with computer or computer with Apple TV/other computer. You can stream video music with 5KPlayer at ease afterwards. While AirPlay iPhone/iPad to computer, just click a red recording icon on the computer, it will record the screen as long as you need. In Library of 5KPlayer, all the played, added, downloaded files are arranged in order. Here you can switch the playback mode by repeat, random, etc. In addition, converting video to MP3/AAC function is provided. Compatible with Microsoft XP SP2 or higher(32 / 64bit), Vista (32 / 64bit), Windows 7 (32 / 64bit), Windows 8.1 (32 / 64bit), 8 (32 / 64bit), Windows 10, and later. Compatible with Mac OS X Snow Leopard 10.6, OS X Lion 10.7, OS X Mountain Lion 10.8, OS X Mavericks 10.9, OS X Yosemite 10.10, OS X El Capitan 10.11, mac OS Sierra 10.12, and later.